The warmer weather has turned me into a morning person. Walking up early, making coffee, grabbing a book, and heading out to my back porch has been my daily routine. I'll usually grab some yogurt and granola for breakfast, but lately the fresh fruit at the grocery store has been calling my name. During my last visit, I grabbed nectarines, blackberries, strawberries, and blueberries. 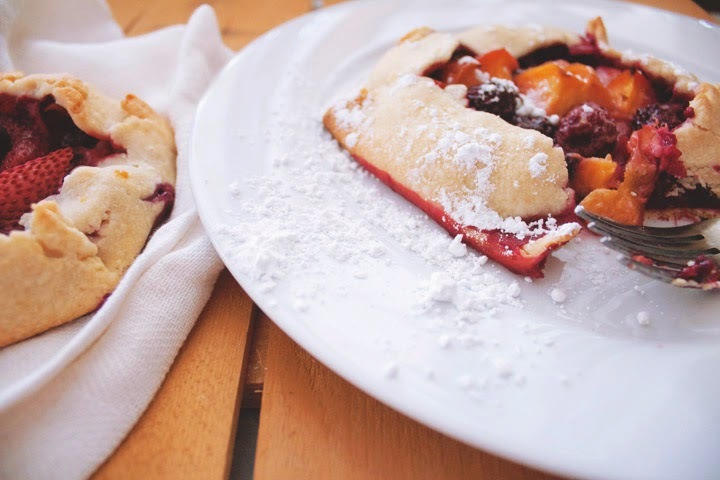 Wanting to make an awesome breakfast dish with these ingredients, I looked over some recipes and decided to bake some free form fruit pies. Have you ever tried to make a free form pie before? This was my first attempt and I'm really happy with how they turned out. You can find the recipe below. I can't wait to try a bunch of different fruit combinations and see which ones I like best. Also, we hope everyone has a nice relaxing memorial day. Remember and honor those who have given their lives while serving in the armed forces. In a food processor, combine and blend flour, salt, and sugar. Add butter and process until mixture for about 20 seconds. Pour 1/8 cup water in slowly and blend till the dough holds together. Add remaining water, if necessary. Turn dough into ball, cover in plastic wrap, and refrigerate for one hour. Once the crust is chilled, divide into four equal parts. Roll each portion of pastry into a 7 inch circle. 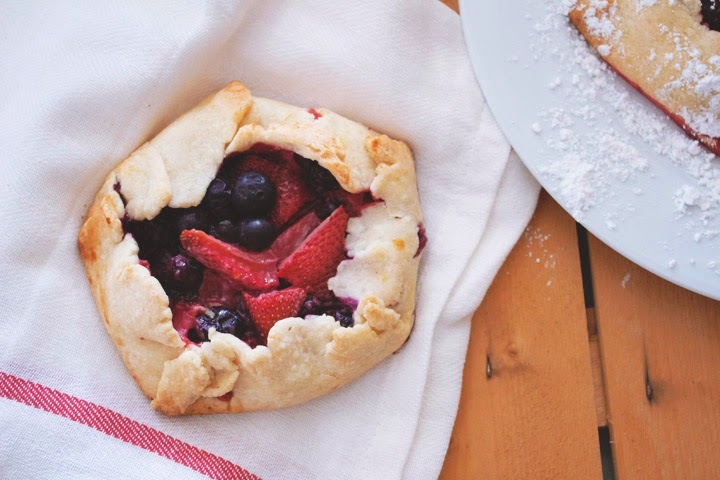 Place the four pastry circles onto two baking sheet (with parchment paper) and place back in refrigerator to firm while you make the filling. In a large bowl, combine fruit, sugar, lemon zest, and flour. 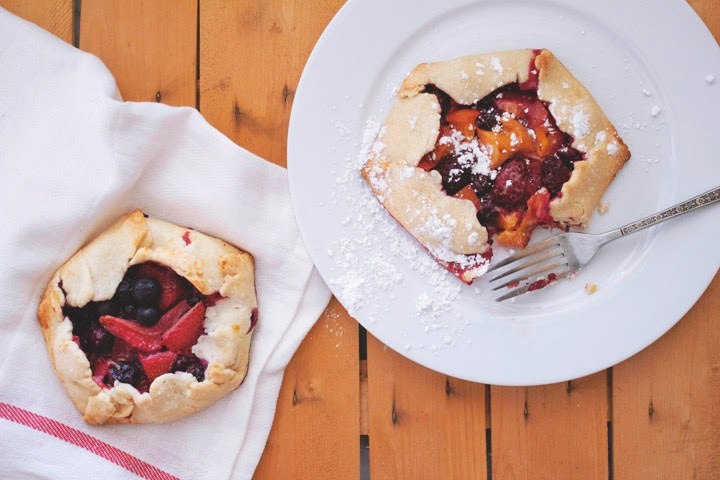 Remove the pastry from the refrigerator and divide the filling between the four pastry circles. * Leave a 1 inch border around the outside edges of the pastry. Next fold the edges up and over the filling, leaving the center open. Press the edges gently so they sticks together. Cover pies and again return to the refrigerator for about 15 - 30 minutes to chill. *I create two different fruit combinations: nectarines and blackberries; strawberries and blueberries. When doing that, taking the filling ingredients and split between two bowls. Add different fruit combinations to the different bowls. 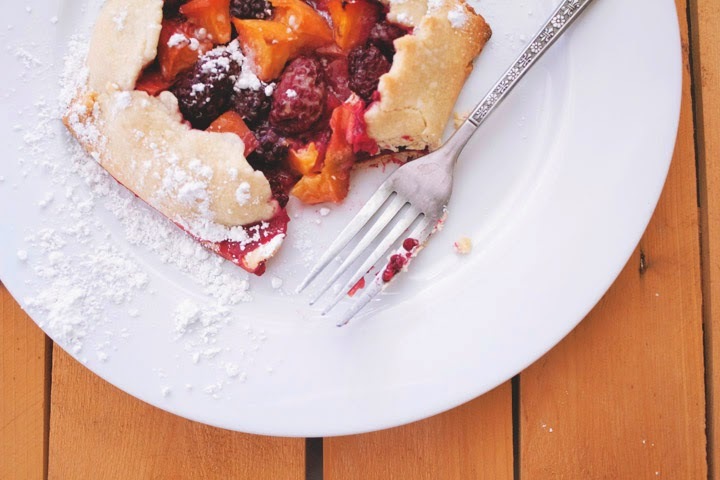 Remove the assembled pies from the refrigerator and bake for approximately 25-30 minutes or until the crust is golden brown and the juices are bubbling and start to run out from the center of the pie. Serve with whipped cream or vanilla ice cream. We tried powdered sugar too (yum! ).